I don’t normally re-blog things other people write. In fact this is the first time I have ever done that, but this is just really good information. The blog it came from, called gluten free mommy, doesn’t seem to have had a new post in several years. So it might just be time to share this valuable information I found while searching for a good gluten free cake flour for the gluten free chocolate melting cake. Is there a 1:1 flour substitution for wheat flour? No. Gluten free flours work best in baking (most of the time) when they are used in combination with each other. However, there are some exceptions- recipes that call for a small amount of flour (like Orange Almond brownies) may work well with a 1:1 brown rice flour substitution. Another example where you wouldn’t need a gluten-free flour mix combination would be when thickening a sauce like my Green Bean Casserole recipe– sweet rice flour would be a fine 1:1 substitution in that instance. When going gluten-free, how did you pick which flours to buy first? Unfortunately, there is not a one-size fits all solution! You need to decide what is important to you when you start experimenting with flour mixes. glycemic index- this would be a good thing for everyone to consider but especially diabetic celiacs or those trying to lose weight. additional allergies- if you have to adhere to a casein-free or nut-free diet, you would obviously need to take this in consideration when picking a mix. taste- not everyone likes the same things! For example, whole grain teff flour tastes great to me in a lot of cakes, but some of my readers prefer not to use teff because they personally don’t like the taste it imparts on some baked goods. whole grain- getting enough whole grains is on everyone’s mind these days. I try to utilize whole grain flours in my gluten-free baking mix to make sure my family is getting the daily whole grains they need. performance- this simply means how well your mix performs. Is the cake moist? How is the texture? Does it taste good? Some people make sure to use all whole grains in their flour mix- I will occasionally compromise this (for example: in the case of tapioca flour) if I feel the overall recipe will be better for it. In my opinion, a cupcake is not supposed to be completely good for you. digestion- some people do not tolerate certain flours well. I don’t use bean flours at all. Enough said there! Should you just buy a store-bought pre-made mix or make your own? Pre-made mixes work well for a lot of people. Pamela’s Baking Mix can be a great all-purpose gluten-free flour, but there are drawbacks. It can be expensive and I find that my own homemade mixes perform better than Pamela’s- for example, my pumpkin pancake experiment. Another popular mix is Bob’s Red Mill All-Purpose Gluten Free Mix, but the bean flour keeps me far away from that gluten-free flour mix. Where do you store your flours? I keep my gluten-free flours in the refrigerator in canisters for a longer shelf life (whole grain flours do get rancid because they haven’t been over-processed and stripped of their nutrition like regular all-purpose flour) and because it is more convenient for me. Some people do fine with their pantry because they use the flours so quickly and they may have limited refrigerator space. I use labeled canisters because my fridge looks neater and it is easier to prevent messy flour spills. I know some people who handle it beautifully, but I could never get the hang of it and I ended up with a wad of 12 different zip lock bags in the fridge. If you pre-make your flour-mix all you need is one zip lock bag or one canister, but since I am always experimenting or using different flours I have one canister of pre-made mix and keep the flours in separate canisters also. Where do you buy your flours? I typically buy my flours from Whole Foods or Amazon. I have heard it is cheaper to buy some of the rice flours from a local Asian grocery store, but I have not researched this locally. Call it laziness! Since Amazon sells some of my “must-have” gluten-free flours (and I am a total cookbook addict), I am going to try Amazon Prime to make faster shipping more affordable. Even though some of the gluten-free products are not eligible because they are sold through third-parties, I think it will be worth it for me since we tend to order a lot of gluten-free flour from the Bob’s Red Mill and Arrowhead Mills brand that are eligible and other odds and ends throughout the year. I love the convenience of online shopping, especially now that I have two little ones under two. How do you measure gluten-free flour? This may sound like a silly question because it is essentially the same as measuring regular all-purpose wheat flour. However, when making two batches of banana bread I looked down and saw that I had done a bad job measuring my flours. It was visibly obvious! I went out and bought a Salter scale to measure my flours by weight! This has helped me be more consistent with my measuring- especially with tapioca flour and potato starch! It is important to measure well, so you end up with just the right amount of flour and a good finished product. Update: For the denser flours, I do use different weight measurements. I am coming up with a chart for this and it will be available soon. Is it important to sift gluten-free flour? I always sift my gluten-free flour to make sure I do not end up with pockets of one type of flour or pockets of xanthan gum or baking powder. I bought a sifter for this purpose, but you can use a whisk too! Do you have a gluten-free baking mix? I am not using a baking mix right now because I am in experimentation mode. However, I love equal parts sorghum flour, tapioca flour, and brown rice flour for cakes, muffins, and quick breads. I made my No Frills Chocolate Cake with that combination. I also like teff flour thrown in that mix- my Chocolate Pumpkin Cake is an example. I am using more sweet rice flour now and I am experimenting with millet flour. How long can I store my gluten-free flour? Most gluten-free flours, such as brown rice flour, will keep in the refrigerator for four or five months. Gluten-free flour can be kept in the freezer for up to a year. Before you buy a large amount of flour, make sure to consider if you will use it in this time frame. Is there a “magic blend” of gluten-free flours that will work for all recipes? Unfortunately, no! For optimal results, I think it is best for your muffin, cake, or brownie gluten-free baking mix to look very different from the one you use for pizza or bread! That is why I keep a lot of my flours separate so that I can mix them around as needed for recipes. On this blog, I spell out exactly which flours I use in each recipe so that you will know. It is hard with so many choices out there, but I have come to think of my flours as a collection! tee hee. Which flours do you always have on hand? Sorghum flour, Tapioca flour, Brown Rice Flour, Cornstarch, Teff, Cornmeal, and Sweet Rice Flour. Yikes! Not to be confused with potato flour, potato starch is a wonderful thickener and can tolerate higher temperatures than cornstarch. It adds moisture to baked goods. 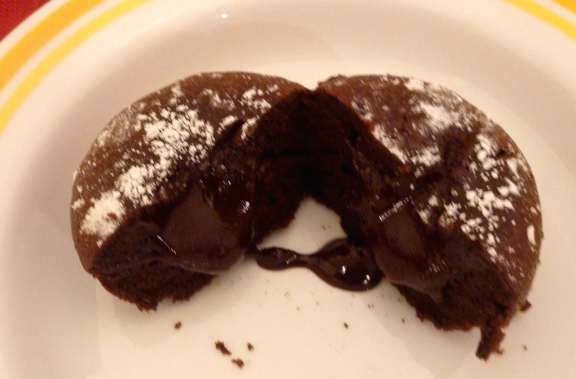 A lot of mainstream flourless chocolate cakes recipes contain potato starch. This is generally considered the most neutral tasting thickener, but it is definitely the priciest! Use arrowroot for acidic sauces. I rarely use this one. I used it at Thanksgiving this year to thicken our gravy, but I may go another route next year. I know a lot of you use it on an occasional basis, so I thought I would mention it here. Buckwheat Sweet Potato Bread recipe. I like baking with this flour because it gives baked goods a nuttier taste. Quinoa flour is wonderfully healthy; it contains a complete protein. I think quinoa flour also lends more moisture to gluten-free baked goods. This meal/flour adds moisture and protein to baked goods. I use it in baked goods all the time. The cake above was made with almond meal, sweet rice flour, and brown rice flour. It is also great for making pie crusts or cheesecake crusts! This works wonders for gluten-free baked goods. It is expensive, but you only use a little at a time. I only use about a teaspoon for quick bread! It is a great binder. I keep this in a canister. If it spills, do not get it wet because it becomes very sticky and hard to remove. To remove xanthan gum once it has hardened, I use a spatula. I like Bob’s Red Mill Baking Soda. Make sure it is aluminum-free and gluten-free. Featherweight Baking Powder is gluten-free and also corn-free. Make sure your baking powder is less than six months old. Go check out more gluten free flour mixes at Gluten Free Cooking School. This entry was posted in Randoms, recipes and tagged baking, best gluten-free flour, flour, gluten free, gluten free flour mix. Bookmark the permalink. With so many flour options it almost sounds more complicated after reading this. It’s good information for those who need to use gluten free flours and who do a lot of baking but for the rest of us I just can’t see buying that many kinds of flour. It’s a good thing for me and Liza that we don’t need to follow a gluten free diet. Linda might get a lot out of this though. It is more complicated than wheat flour, but people who can’t have gluten don’t have much choice. The alternative flours are also healthier because they don’t have all the genetic modifications modern wheat has. I like to use the gluten-free oatmeal along with a combination of flours, especially in cookies and biscuits. That is useful information, though. Linda likes the millet flour and I usually use along with several other flours and the oatmeal. I haven’t tried either of those, but it does sound good. There are so many options I guess people just have to experiement until they find the ones they like that work for them in whatever it is they are making at the time since some flours work better for some things and others for other things.